Here you will find great deals from different stores. 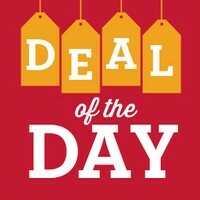 DEAL of the DAY is a 24-hour great deal! Its super hot, so take it or it is gone by the end of the day! DEAL of the WEEK is a 7-day great deal! At this moment Wow Coupons offers 0 Coupon Codes and 7 Promos for DEALS of the DAY Category. Deal of the Day pricing is good only during the specified 24-hour period, from 12:00 a.m. to 11:59 p.m. PST, while supplies last.